The design painted on this serving ladle shows a large seal that has been harpooned. The harpoon line comes out of its back and connects to a float made from an inflated small seal skin. The harpoon shaft (a crossways line) is also shown. 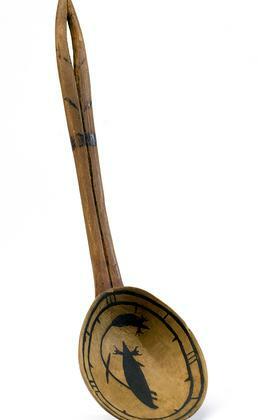 When seals were killed, women used a ladle like this to offer them fresh water. Neva Rivers: We all have red clay. This [red coloring] is from the clay, what they made it from. They make sure they put oil on it, so it [color] will stay longer. Joan Hamilton: Seal una-ll’ cauluni. Neva Rivers: Qerruinaq. Naug im’ imkut augarniarci narulkaraaqameng qerruinek kanavet, kukgam nuvua imna augarcetuli kanavet pikan wani uum qerruinamun. Nayirmeng qerruumalriameng pingqerciquq una. Kaputeng angllungremi una qerruinaq avani pingmaqluni. John Phillip, Sr.: Qerruinaa-gguq wani-wa. Joan Hamilton: This is a seal that’s been harpooned.